The BitTorrent protocol is a very effective and efficient means of sharing and “downloading” content. Online streaming services such as those offered through the Kodi app or via streaming websites are grabbing all the headlines these days, but traditional torrenting remains very popular. By using a VPN, you can stay safe on sites, for more information visit our best VPN for torrent sites guide. In order to torrent you need a BitTorrent client. This is the software that allows you to share files on your computer with other BitTorrent users in order to “download” content. The great news is that there are plenty of good BitTorrent clients out there. Warning: Torrenting itself is technically legal providing you have content owners permission. If you do not have permission it is recommended that you do not torrent because of the way in which the BitTorrent protocol works, it is easy for copyright holders to discover the IP address of everyone downloading their intellectual property. They can then notify your ISP, or take legal action against you. It is, therefore, important to protect yourself with a VPN when downloading from the websites listed below. A VPN will hide your real IP and encrypt your traffic so your ISP cannot see what you are doing. It is also a good idea to use a kill switch in order to protect you if the VPN disconnects while downloading. For a more detailed article about the best VPNs to use, check out this article. But back to the topic at hand, what is the best client? Although not strictly necessary if your VPN software features a kill switch, I have always appreciated this extra layer of security. It prevents the client downloading torrents when the VPN is not active. qBitTorrent not only supports this feature, it makes it much easier to implement. This was a big factor in me making the change, as was qBitTorrent’s lean-and-mean 100 MB or less install size (exact size depending on platform). There is no bloat with qBitTorrent! Despite this, qBitTorrent features just about everything most torrenters will need. This includes BitTorrent protocol encryption, torrent prioritization, torrent querying, selective content download, torrent creation, remote access, and RSS subscription. You can search for torrents from within the client, and the built-in media player is handy. qBitTorrent is 100% free and ad-free. It is available for Windows, MacOS, and Linux. For a more detailed look at this excellent software, including instructions on how to bind qBittorrent to your VPN interface, please check out 5 Best VPNs for qBittorrent. Transmission started life as a Mac and Linux-only BitTorrent client, where it built up a formidable reputation. Windows users can now also get in on the act. 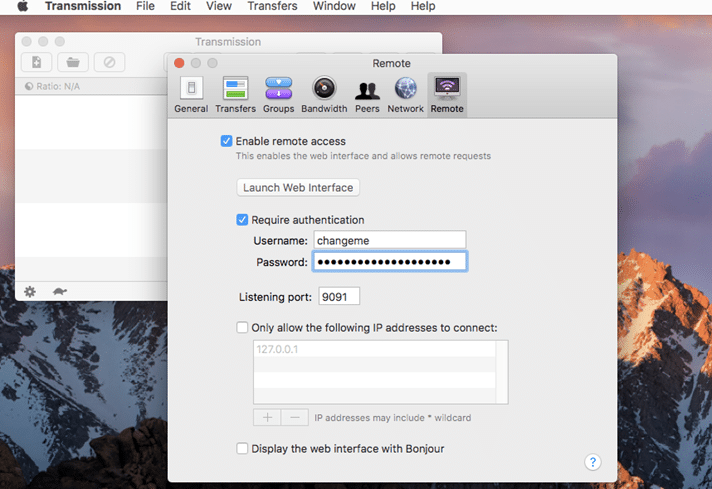 Although a very capable BitTorrent client, the main draw of Transmission is its beautiful user interface, complete with Growl notifications for Mac users. But it’s not all about looking pretty. Transmission features webseed support, BitTorrent protocol encryption, watch directories, tracker editing, global and per-torrent speed limits, and more. It also supports optional add-ons that can expand its feature-set. These include RSS subscription tools and a Kodi plugin. Transmission has recently hit the headlines thanks to a vulnerability that can be exploited by hackers. I discuss this a little later in the article, but a patch is available and the issue is very easy to fix yourself anyway. I have therefore decided to not let this problem affect Transmission’s ranking in this 5 Best guide. Transmission is 100% free and open source. It is available for Windows, Mac OSX/MacOS, Linux (many distros), FreeBSD, Gentoo, and more. But who said a shedload of features is necessarily a bad thing? Most torrenters will never use all the tools available, but there is really almost nothing Torrent-related that Vuze can’t do. This includes being able to bind Vuze to your VPN adapter, but also loads more funky stuff such as content discovery through automated subscriptions, having an integrated media player, remote management, and much more. You can converts files to multiple formats using Vuze’s drag-and-drop interface, and analyse your downloads using a wealth of statistics and visualizations. Vuze is a power user’s dream. On the downside, Vuze is resource-heavy and rather ugly (especially when compared to Transmission!) Its clunky interface is also showing its age. This situation is not helped by the inclusion of ads in the free version, or by the fact that you need to be careful during installation if you do not want to also install a load of crapware. Although Vuze is primarily free, a premium version is also available for $29.90 USD per year. A Vuze Plus subscription removes the ads and provides built-in anti-virus scanning, a DVD burner, and "play now" support. It is, admittedly, pretty funky! This also brings me to the point that, despite its open source roots, Vuze is now closed source proprietary software. It is worth noting that reports of Vuze’s demise appear to be very premature. Vuze 5.7.6.0 was released in October 2017 and is fully functional. Unlike the desktop client, the excellent Android app is lightweight and ad-free. A pro version is now available via in-app purchase (about $4), but I have been unable to determine what features this adds (and am too skinflint to shell out the money necessary to find out!). Vuze Remote is a handy app for Android that allows you remote control your desktop torrent downloads. Vuze is available for Windows, Mac OSX/MacOS, Linux, and Android. Instant streaming of high quality BitTorrent content! All the other programs on this list are BitTorrent clients. You download a .torrent file or click on a magnet link, and the content downloads to your computer where it is stored locally. 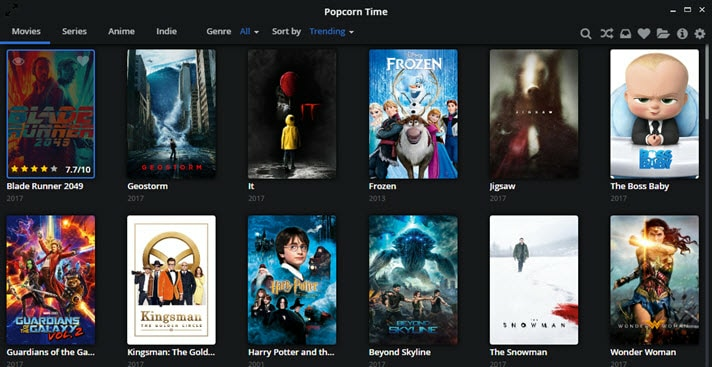 Popcorn Time is different; It is an open source app that uses BitTorrent technology to stream high quality video content to all major platforms. This means that unlike with traditional BitTorrent clients, you can watch a film or show without waiting for the download to complete. You might be thinking "is Popcorn time safe? ", it can be dangerous for your computer, but using a VPN can keep your machine secure. It is notable for having a very slick and intuitive interface, and for providing access to a huge library of up-to-date content. Although primarily a streaming platform, content can also be downloaded locally (and some content is always cached). Various versions (forks) of Popcorn Time are available, but I strongly advise only using one of the forks recommended in Best VPN for Popcorn Time guide. Specific features vary a little depending on which fork you use, but steaming to your big-screen TV via Chromecast, Airplay and DLNA is pretty standard. Popcorn Time is free, and respectable versions are free from ads and other crapware. It available for Windows, Mac OSX/MacOS, Linux, and Android. PopcornTime.to even has an iOS VPN App that can be installed without jailbreaking your device. Like qBitTorrent, Deluge is a fairly conventional but lightweight and open source BitTorrent client. Its feature list is not huge, but should be more than enough to satisfy most users. Features include remote web management and support for magnet links. Functionality can be further extended with a range of both in-house and third-party plugins. Highlights include plugins for RSS support, Growl notifications, streaming while downloading, and more. Deluge is completely FOSS, with no ads or crapware. It is available for Windows, OSX, Linux (various distros), and FreeBSD. BitTorrent is a popular peer-to-peer (P2P) file-sharing protocol. Instead of being stored on a centralized server from which you download, torrented files are shared among many other BitTorrent users. Popular files can easily be shared among hundreds of users in this way. When you “download” (which is something of a misnomer when it comes to torrenting) a file using the BitTorrent protocol, what you are actually doing is sharing small pieces of it with everyone else who is downloading that same file. A file is “downloaded” once you have all the pieces needed to reassemble that file. It is considered good form to “seed” (continue sharing) the file for a while after it has been downloaded, in order to help others reach 100% completion. BitTorrent content is downloaded locally, so it is available forever and can be easily physically transferred between devices. Literally, any kind of digital content can be download – not just video content. This includes software, images, eBook, games, and… you name it! But when it does come to video content, the quality is often considerably higher than streamed content. This is because there is no need to keep file sizes down to avoid buffering issues, since content is played locally. BitTorrent is a very efficient and resource-light way to share and promote your own content with others. Many Linux distros find torrent links are the best way to distribute their software without having to host it on costly servers. BitTorrent content is shared among multiple home computers. This is not good for privacy because sharing files with a bunch of other random “downloaders” on the internet is hardly private. Using the right software (which includes many popular BitTorrent clients), it is very easy to see the unique Internet Protocol (IP) addresses of every other person also sharing (“downloading”) the same file. As demonstrated in Vuze above, I can see the IP addresses of every other person who is downloading the same files as me. A VPN will hide your IP address information from other downloaders. A VPN encrypts all internet traffic between your computer and the VPN server. The above means your ISP can’t see what you download. VPNs with robust logging policies will have nothing to hand over to the authorities, no matter what pressure they may come under. A VPN will also unblock websites if they are censored for any reason. So as long as P2P is permitted, a VPN is very effective at protecting your privacy while downloading. For a more in-depth look at how VPNs work, please check out VPNs for Beginners – What You Need to Know. For a more in-depth guide to using a VPN while torrenting, check out Best VPN for Torrenting guide. Some BitTorrent clients support BitTorrent protocol encryption. These include Transmission, qBitTorrent, and Vuze. It is a feature designed to hide the fact that you are torrenting from your Internet Service Provider (ISP). Using BitTorrent protocol encryption is therefore probably better than using nothing at all, but using a VPN provides much better protection while downloading. How do I use a BitTorrent client? One reason for the popularity of online streaming services (including via the use of Kodi boxes) is the perception that torrenting is a geeky pastime that requires technical know-how. In reality, however, torrenting is very easy. Download and install a BitTorrent client from the list above. (Optional but strongly recommended) Ensure you have a VPN running. This will bypass censorship of torrent sites, hide your IP from others you fileshare with, and hide your downloads from your ISP. Check out our VPN for Torrents guide for a list of recommended services. Visit a BitTorrent website. These websites host links to torrent files. You can browse for content that interests you, or search for something specific. Many websites include user-reviews of torrents, which can help you pick good torrents. When you have found the content you want, simply click on the torrent link or magnet link. The torrent will open in your BitTorrent client and begin downloading. When the download is 100% completed, enjoy! Some BitTorrent clients have media-players built-in, but VLC will play pretty much any media file you can throw at it. BitTorrent is a decentralized file-sharing platform. In order for it to work, users share files with other users. This happens while you download a file, but it is considered good form to leave your BitTorrent client open after you have finished downloading a file in order to benefit other users. This is known as seeding, and it is considered good netiquette to seed to a ratio of at least 1:1 (i.e. upload for other users the same amount of data that you download.) 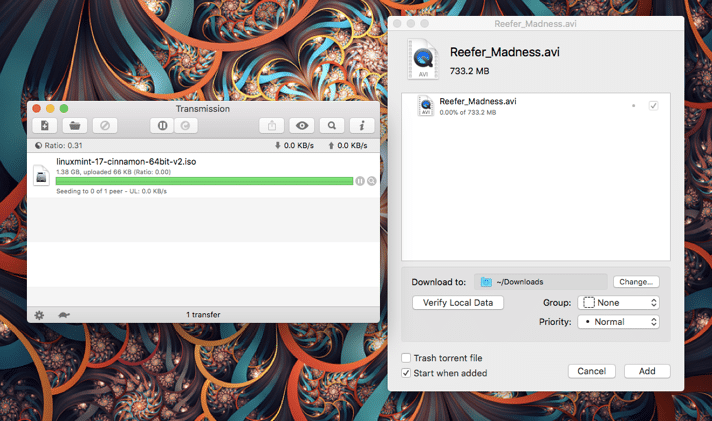 Most BitTorrent clients will display the seed ratio of downloaded files. You don’t, to be honest, ever need to know much more about torrenting than the information provided above. If you ever wish to explore the subject further, however, this glossary is a good introduction to the jargon used. Movie torrents, in particular, have a great deal of jargon associated with them. In order to make informed decisions about the content you plan to download, it is useful to familiarize yourself with it. uTorrent (and its almost identical sibling the official BitTorrent client) remains the most popular BitTorrent client in the world. It is therefore reasonable to ask why I have not included it in this 5 Best list. uTorrent is closed source and supports itself with ads. These ads can be turned off if you delve deep enough into the software’s settings, but this is still very irritating. It is my personal view (and hey, this list is a personal choice), that this means uTorrent has all the disadvantages of Vuze, but not as many useful features. So if you want a slightly clunky closed-source ad-supported BitTorrent client, but one that compensates for this by offering a wealth of features, then use Vuze. Other opinions are available. A security researcher has discovered a flaw in Transmission that could allow hackers to execute malicious code on targets’ computers. In theory, this could allow them to completely take over the infected system. The flaw takes advantage of lax security in Transmission’s remote web access feature. Note that this is a proof of concept attack, and there is no evidence of it being exploited in the wild. A patch is already available, and Transmission has announced that an update will soon be available that will incorporate it. Alternatively, the flaw is easy enough to fix for yourself. If you don’t use the remote web access feature, simply turn it off! Go to Preferences -> Remote, and uncheck “Enable remote access.” If you do use the remote web access feature, then change the default password to something secure. Easy! Note that the security researcher who discovered the flaw has hinted that other BitTorrents clients may also vulnerable. It is probably therefore a good idea to check similar settings in whatever client you are using. If anything, the torrenting crowd is over-served by great BitTorrent clients! Indeed, this top five list hardly even scrapes the surface of the many that are available. The fact that most of them are free and open source software (FOSS) warms the cockles of my heart! With such a wealth of options available, I’m sure many of you will have a favorite that is not listed here. If so, do please write in to tell me and other readers why you think it is so great! tried a lot of clients in the past, and never came acreoss qbit. Well what to say .... wonder what they payed Douglas to make that the winner .... it's amongst the slowest clients ever seen so far. Not to mentioned that's configuration is a real pain, and the given hints on their website on how to continue with partly feched magnets did fail aswell. Wipin it from disk ... was the best idea about this fancy winner and one which it was fast. Hi anony mouse, Payed? qBittorrent is a non-profit open source community-based project! I use it as my personal torrent client and find it to be very fast that works very well and is a cinch to use. YMMV. Have you tried port forwarding to resolve speed issues? I noticed that qBittorrent is seeding alot less than Bit Torrent Client, i tried to switch with it because of the annoying ads on Bit Torrent, but i had to switch with uTorrent 2.2.x because Bit Torrent was not accepted on my Private Tracker... too bad because i really liked the interface of qBitTorrent, the weight its very light for the computer to run.. never found out why qBitTorrent was so bad on seeding.. and i could literally say it was the client the problem because i transfered all my bit torrent list into qBitTorrent, closed Bit Torrent, Tried to seed for a few hour, nothings or almost was seeding, then i closed qBitTorrent and reopened Bit Torrent, seeding started again like crazy (total 2.0Mo/sec ) , Checked all the setting, everything was the same in both client..
Hi ExeaT, Hmmm. The only problem I have experienced with qBitTorrent is that occasionally when I add a new torrent it won't add seeds until I restart the program. The issue is rare enough, however, for me not to consider it a major problem. Which one auto-encrypts the data? Hi reo, Transmission, qBitTorrent, and Vuze feature BitTorrent protocol encryption. However, "Analysis of the BitTorrent protocol encryption has shown that statistical measurements of packet sizes and packet directions of the first 100 packets in a TCP session can be used to identify the obfuscated protocol with over 96% accuracy." In other words, you are much better off encrypting your torrent traffic with a VPN. In addition to this, a VPN will hide your real IP from other torrent users, whereas BitTorrent protocol encryption won't.